The Arc of History at the U.S. Highway 550/160 intersection is going away. On Tuesday, the Durango Public Art Commission decided to remove the controversial piece of public art after discussing options, said Sherri Dugdale, assistant to the city manager. The decision was reached in part because of the prohibitive cost to repair vandalism damage, according to a release from the city. But the art commission was concerned about the message that might send. “We wanted to be careful that we weren’t sending a message to the community that said, ‘Well, if you don’t like a piece, just go ahead and damage it and we’ll replace it,’ that’s not what we are doing here, that’s not the message,” Dugdale said. The Arc was installed in July 2014 and was significantly damaged about a year later by an unknown vandal or vandals. “If you walk up and look up at those stones, all of them, with the exception of the ones on the ends that are really hard to get to because they are so high, are damaged,” she said. The commission discussed multiple ideas about how to best restore the piece and decided that the only way to maintain the integrity of the artwork was to commission the original artist, Tom Holmes, for the job. The estimates were intended to cover potential expenses and ensure he would not be liable for any additional cost that might come up during the process, Holmes said. This was done directly at the request of the city. “Sherri Dugdale requested me specifically to give a high estimate for insurance purposes only, which I did, because there are unknown costs,” Holmes said. Dugdale said that was not true. “He called me for advice on the value of the piece, and I said, ‘You need to give them an accurate estimate of what you think the cost to replace would be,’” Dugdale said. Holmes said he wanted $8,000 for his artist fees, with an additional $2,000 contingency, which is within the range of his normal fees for art pieces. The rest of the cost would fall to the city, including tools, vehicle rental, materials, room and board, airfare and police presence during the installation, according to a copy of the estimate provided by Holmes. An additional cost came in the form of traffic control from Colorado Department of Transportation, which was quoted at $5,000, Holmes said. That fee was not part of the original sculpture installation because the road had traffic control during the construction of the new intersection. The letter says that the sculpture had been determined to be a total loss by the insurance carrier, the Colorado Intergovernmental Risk Sharing Agency, because of the damage received and valued it at $28,000. The letter offers this amount to Holmes to restore the Arc “including all expenses, travel, permits, etc.” It goes on to say that the city is willing to make services and equipment available to assist in the restoration, but the budget cannot exceed the amount provided by insurance. Holmes says he did not get a letter from the city or the commission. “There is no letter here, there never was a letter sent, for them to not call me up and say, ‘Hey Tom, did you get that letter?’ There’s a reason that no letter showed up here, because they had a predetermined outcome.” Holmes said. Holmes provided an email he said he sent May 1 inquiring about the desire to repair the Arc before the end of the year, and he said he received no email response. “Not a single phone call from anyone in Durango speaks volumes as to the real agenda here. Which was, don’t repair to gain back support for those involved and blame Tom Holmes for it,” Holmes said in an email. In the months after the installation of the Arc of History, The Durango Herald received many letters to the editor expressing a wide range of opinions. Betsy Janeczek expressed that perhaps there were better expenditures for the funds spent on the piece of art. On Friday, Janeczek said she is concerned about what the city might replace the Arc with, and if it will add to the confusion of the relatively new U.S. Highway 550/160 intersection by distracting drivers. She still thinks the city could find a better use for the money than replacing the Arc. Another letter by Tierney Skahill expressed that while she wasn’t the biggest fan of the design, she appreciated the sculpture because of the way the public interacted with it, in the form of the decorations and letters to the editor. “I like Durango because we like to play with poor public art, whatever it may be, and I think that the best thing about our town is we make fun of ourselves and we play with our art, we decorate it, we have fun with it and it makes us laugh and that is priceless.” Skahill said Friday. City crews will remove the sculpture in the near future and there are no plans to replace it, Dugdale said. But the site remains on the city’s Art Location Master Plan, she said. The city has the $23,000 from the insurance company – $28,000 minus a $5,000 deductible – to use at its discretion, which could be used to commission a new piece of art for the intersection, she said. 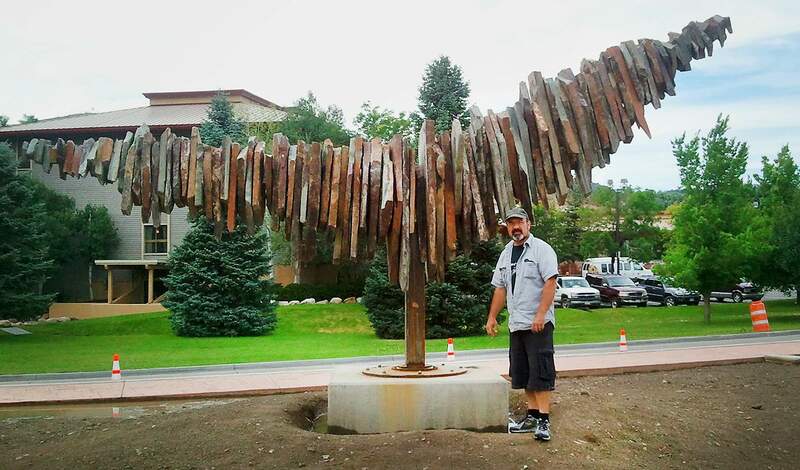 The city of Durango installed Tom Holmes’ Arc of History sculpture in 2014. The $28,000 piece of public art at the U.S. Highway 550/160 intersection was the target of controversy and hijinks. The sculpture was decorated as a dinosaur and dragon. In July 2015, vandals inflicted serious damage. This week, the city’s Public Art Commission decided to remove the Arc rather than pursue repairs. July 2014: Arc of History installed. October 2014: dinosaur head appears on sculpture. November 2014: teen bandits pilfer dinosaur head and then turn it over to police, and it is claimed by artist Benjamin Foisel. Resident Karen Zink bids $5,000 on dino head in auction, money is donated to Durango Arts Center. February 2015: Chinese dragon head appears on sculpture, which is removed by police. March 2015: replica ‘arcs’ appear alongside sculpture. April 2015: egg nest appears beneath Arc. May 2015: baby dinos appear to have hatched. July 2015: sculpture substantially damaged by vandals. August 2015: Durango Public Art Commission agrees to restore Arc. March 2016: Easter eggs and bunnies appear under sculpture. July 26: Durango Public Art Commission votes to remove Arc.